Copying spells that divide damage among any number of targets. — Return target instant card from your graveyard to your hand. 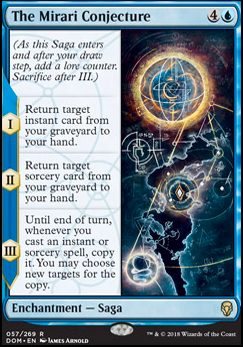 — Return target sorcery card from your graveyard to your hand. — Until end of turn, whenever you cast an instant or sorcery spell, copy it. You may choose new targets for the copy. 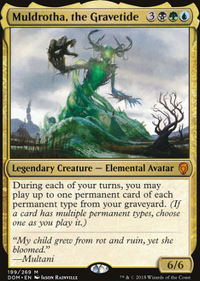 Prophet of Kruphix is now banned in commander. Bonus Round , Swarm Intelligence , The Mirari Conjecture , and Thousand-Year Storm are some great forking spells, where you don't have spend extra mana or be able to fork multiple spells. 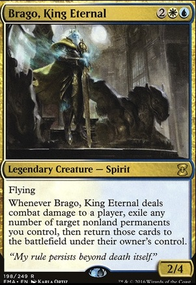 What I think you're after is a take on the standard gate deck except that it leans heavily on the direct damage plan to win games. The advantage of this being removal doesn't effect your plan as much but the disadvantage being that no burn spell could ever deal more damage than a Gatebreaker Ram attacking for a couple turns. Considering this, I think Sarkhan's Unsealing is probably not right for this plan if you're really cutting down on the creature count. Risk Factor seems decent if you think of it as a 6cmc 8 damage Banefire . A problem you'll probably run into is the inherent card disadvantage of these type of effects could leave you out of cards quite quickly if you don't draw Guild Summit or it gets removed. I'd suggest trying to find some redundancy for this effect. Speaking of which, The Mirari Conjecture could be a nice way to re-buy and double up burn effects especially considering ramp makes that plan all the more viable. Fight with Fire is also a sweet two card combo with it and works as a removal spell if your opponent is putting out too much pressure. Finally I'd suggest a transformational sideboard plan. Having a creatureless mainboard and 8 colossi or rams in the side can really invalidate your opponent's sideboard hate. Looking at your own Narset list gives me some new ideas! 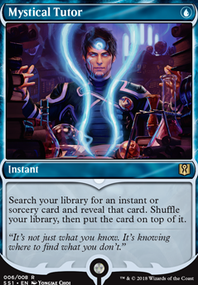 I really like The Mirari Conjecture , Isochron Scepter , and especially Metallurgic Summonings since it fits multiple roles in my token deck. Your description is amazing, am I a mouth breather if I use these cards? I see that you share my love of Dovescape ;). Sinister Sabotage - Counterspell with Scry 1 (in a different form) sure why not? Kira, Great Glass-Spinner - Not a instant, sorcery or wizard but free counter once each turn per creature yes please. Mana Drain -If you have it or can afford/willing to buy cough up the money for it. Keranos, God of Storms - Again not a Instant, Sorcery or wizard but a potentially free Lightning Bolt each turn why not? Chemister's Trick - Could save your life if backed into a corner or could back your opponent in one. Countervailing Winds - If you have a lot of cheap cards that makes this card super nice but i would save this card for the opponents big play as the opponent either loses the card or has to waste the rest of their to save it leaving you able to counter attack next if you survive. Reforge the Soul - Need a new hand? What do you find yourself wanting to return most of the time with Recollect ? You may want to consider The Mirari Conjecture if it's mainly instants/sorceries. You might also consider dropping Arcane Encyclopedia for more copies of Search for Azcanta Flip since it's such a clutch early game play, and scales even better into lategame. As a fellow Mizzix player I can give you some insight based on my experience. Based on your build I would take out Mizzix's Mastery . I know, it is a fantastic card but since you are playing so many X costed spells you can't really take advantage of it since it forces you to play them without paying their manacost which means that X is equal to 0. Here is a list of cards I have in my deck which work pretty well (in no particular order): - Blue Sun's Zenith this card can be crazy with enough counters. I even managed to kill a player by making him draw 80 cards with it. - The Mirari Conjecture get back your precious spells and unleash hell. - Invert / Invent basically playing it for Invent. 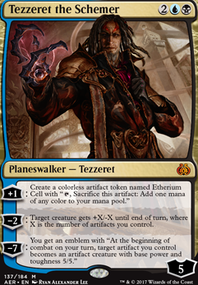 - Apex of Power with enough experience counters this just wins the game. 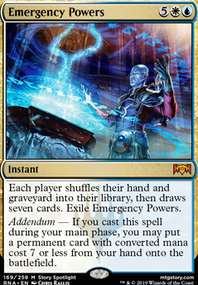 - Karn's Temporal Sundering This can honestly be any extra turn spell but this has the bonus of bouncing an annoying permanent. I had one lying around and I put it in. - Jaya's Immolating Inferno This one is really really good. Thanks for the list since it showed me some cards that I had completely forgotten about so I hope that I helped you as well. Happy spellslinging!